Humans have inhabited South Australia as far back as 20,000 years ago, as evidenced by rock art in the Koonalda Cave on the Nullarbor Plain. Europeans arrived in 1627, and by 1788 Britain had claimed South Australia as part of the colony of New South Wales. Settlements mainly remained along the coast, with only a few explorers venturing farther inland. The British Parliament eventually passed the South Australia Act of 1834, and sanctioned the establishment of the province of South Australia. In contrast to the rest of Australia this new colony was deemed a convict-free land. 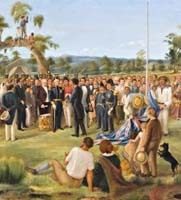 Britain's intention for South Australia was to create an ideal likeness to that of British society's best qualities - no religious discrimination or unemployment, to result in minimal crimes. On January 1, 1901, South Australia transformed from a self-governing colony into a state of the Commonwealth of Australia. An assisted migration proposal brought 215,000 new residents of all nationalities into South Australia between 1947 and 1973. During the 1960s and 1970s in a series of legislations helped South Australia reach a number of "firsts" including a prohibition of discrimination on the grounds of race, color, country of origin, gender or sexuality. As a result of these legislations, in 1976 Sir Douglas Nicholls was appointed Governor of South Australia, the first Aboriginal governor of an Australia state. The present economy of the state relies on mining, manufacturing and agriculture, and a significant finance sector. 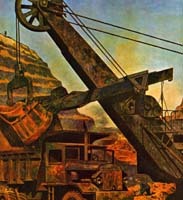 In 1987, the Olympic Dam mine opened, and became the site for copper, gold, and silver production; it is also the largest known deposit of uranium in the world. Today, South Australia is known as a state of festivals and fine wines. Although it has seen its fair share of economic hardship, the state remains politically innovative and culturally vibrant.